I love kids body wash as they are made for their skin. Dial has a new Kids Body and Hair Wash that is made for children 2-5 and 6+. The body wash comes in fun scents like peach,watery melon, and berry. They offer mild cleansing without drying out your child's skin. My boys received the watery melon Dial Kids Body and Hair wash to try out. My son loved the way it smelled so good and said "mmm" when I washed his hair with the body wash. I love the colorful bottles the body wash comes in. My son gave Dial Kids Body and Hair wash two thumbs up. The Dial Kids Sweepstakes Is LIVE! In conjunction with the NEW Dial® Kids Body & Hair Wash Insider Kit, Dial is proud to introduce the Dial Kids Sweepstakes featuring NEW Dial® Kids Peachy Clean for ages 2+, and Dial® Kids Watery Melon for ages 6+. One lucky winner will receive $1,000, while 250 second place winners get to try NEW NEW Dial® Kids Body & Hair Wash for FREE! 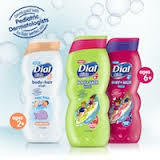 Dial sent me some coupons to share with my readers,so you can buy New Dial Kids body and hair wash. I will be giving away 2 coupons to one lucky reader. Just enter on the Rafflecopter below and good luck! I like Lemon, my daughter likes strawberry and my son likes watermelon. My favorite scent is japanese cherry blossom. That's the one I use most. But I also have a fresh cucumber that I like really well. It's really clean smelling. Looks beautiful.Let me start by saying I think this is great. I need for my baby to clean his hair and body. Awesome find and write up.